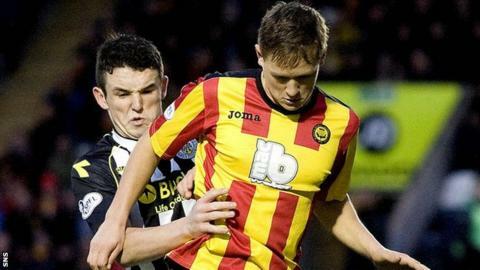 Midfielder James Craigen feels Partick Thistle are going into Friday's crucial Scottish Premiership encounter with St Mirren in good heart. Both sides won last week to boost their chances of avoiding the relegation play-off spot. Thistle, who trail St Mirren by a point, are two points clear of 11th place. "There is pressure because there is a lot at stake but last week's win has given us a big lift," said Craigen. "We had more or less the same squad last season and we got promoted, and that was pressure. It was neck and neck. "We have all played a lot of games now this season and we are all good at handling the pressure. We can't use it as an excuse. "There have been more fans and bigger stadiums, and we have experienced boys like Lee Mair and Paul Gallacher come in to help the younger boys. "The manager has been positive since he came in, telling us we are all good players and being positive." Craigen expects an exciting atmosphere at Firhill when the Buddies visit. "I think some of the boys like playing Friday nights - it's a bit different," he said. "At the start of the season we played Hearts and Dundee United on the Friday night and the atmosphere was really good. "I'm sure our fans will come out in their numbers to support us as they have done all season." Manager Alan Archibald believes it's important his players do not let any tension get the better of them on Friday. "You want the players to relax and go out and enjoy it as well, because when they get too uptight they don't play and they start making bad decisions," he explained. "They did that last week. They were hungry for the game and they were up for it, but at the same time they were relaxed enough to pass the ball and at certain times we got that bit of quality that got us the victory."